We hear about feeding schedules for babies all the time. The timing of meals and snacks — or an eating schedule — works really well for kids, too. So many families are busy these days and their food routine is chaotic. No set times for meals or snacks. No plan for what those meals and snacks will be. All this chaos causes stress. Having a food routine separates eating from other activities. These spaces — or timely intervals — throughout the day can help your child develop and hone his appetite regulation skills. In this article, I’ll explain the eating schedule that supports your child’s nutritional needs while helping him tune into and regulate his appetite. Your child’s appetite is his or her desire to eat food, whether that be due to hunger, or other reasons. Kids can be truly hungry, which is what I call physical hunger. For example, with ‘head hunger,’ kids may think they’re hungry because someone else is eating, triggering a desire to eat as well. Or, a child may have access to a food they love but haven’t eaten in a long time. This can spike their desire to eat (appetite) and make them think they are hungry. Appetite regulation is the ability to eat when hungry and stop when full. It’s a true sense of physical hunger. It’s also the acknowledgement that external triggers may be the reason for perceived hunger. The ability to regulate your appetite is the foundation of lifelong healthy eating and living. The opposite can be true, too. Erratic eating leads to a lack of appetite and inadequate eating over time. Sometimes this happens to the toddler or the picky eater. Developing a schedule for meals and snacks helps your child get the variety of nutrients she needs in her diet on a daily basis (40 different ones!). One of the things I help families with as a pediatric nutritionist is meal planning. Understanding the different food groups and how to plan them into daily meals helps your child get closer to the nutrients he needs. But you also need to know how to balance sweets and treats to keep the focus on nutrition and not let them take over. When kids get the nutrients they need, they grow well and are able to maintain their health. This can translate to fewer illnesses. When we pair balanced meals with an eating schedule, the magic starts to happen. Meals and snacks that are nutritious, filling, and spaced out in a way that makes sense for your child allows appetite regulation to be much easier, and more natural. Translated: Your child will be hungry at meals and less likely to complain of hunger between them. The timing of meals and snacks change as kids grow. This is something that seems obvious but parents aren’t always changing the schedule when they need to. For example, I meet many kids who are eating three and four snacks each day. This is too many! Only very young children need frequent meals and snacks. As kids grow and their tummies get bigger, they can eat more. Their stomachs can hold more food. Naturally, this will extend the timeframe between meals and snacks. Little ones (toddlers and young preschoolers) require three meals and up to three snacks per day to meet their nutritional needs for growth and development. Tiny tummies make it important to offer frequent meals. Kids in school need about 3 meals and 1-2 snacks per day. Younger school-age kids (grade K through 2) may need to gradually transition down to two snacks per day. This will be dependent on where they are in their development and growth stage. Older school-age kids will do well with one snack per day. The good news is, many schools allow time for a morning snack. Hopefully, this is a nutritious snack. If you’re packing a school snack from home, I have some guidelines and a handy e-guide on how to do this! Typically, a child’s second snack will occur after school. Teenagers are like adults. They do well with three meals and one snack each day, unless they are an athlete requiring more nutrition for athletic performance, or are in a growth spurt and need additional calories and nutrients. A balanced diet represents most of the USDA MyPlate food groups, including protein foods, dairy foods (or non-dairy substitutes), fruit, vegetables, and whole grains. As mentioned, when planning meals, aim to offer most food groups at a meal and try to incorporate a variety of foods within each food group. For example, within the fruit group, offer a range of options such as strawberries, apple and peaches. If you’re planning for grains, vary it up with cereal, oats or cream of wheat. Try to avoid offering the same types of food over and over. Mix it up so that your child gets exposed to a number of different nutrients throughout the day. A general rule of thumb is to offer four to five food groups at meals, and at least two to three food groups at snack time. What is the Best Schedule for Meals? It is good for children to have a structure to their day, and with meals and snacks, this certainly holds true. For toddlers and young preschoolers, an eating schedule that spaces meals and snacks to every two and half to three hours works well for most. For school-age kids, eating intervals of three to four hours seems to be most effective in preventing too much hunger and overeating in children. Teens do well with an eating schedule that spaces meals and snacks at every four to five hours. What doesn’t work well for any child is a sense of unpredictability around when they will eat. Try to set a daily eating schedule that stays consistent for meals and snacks in your home. Based on the intervals I outlined above, let’s look at a sample meal plan for a school-age child. Ideally, you want to keep your meals and snacks flowing during the day, especially during the younger years. This routine and rhythm will build predictability and security around food and eating, and help keep undesirable behaviors, such as overeating, at bay. The emotional response from a child who is unsure about when meals or snacks will be happening can build insecurity around food and eating. Insecurity can be seen in the following ways: rapid eating, preoccupation with food, frequent questioning about when and what is being served for meals, and “sneak eating”. Promote rhythm in your child’s eating experiences by staying on time, balanced, and being predictable. And, of course, make sure you’re using a feeding style that promotes structure, boundaries and autonomy. With feeding, this takes a little bit of planning and practice. The results? A child who learns to regulate his appetite and eating, lives in a healthy body, and who is less fixated on food. Want to see if you’re on track with raising a nourished, healthy child? Snag my checklist below! Send Me How to Nourish a Healthy Child Today! Need help with scheduling and planning snacks? 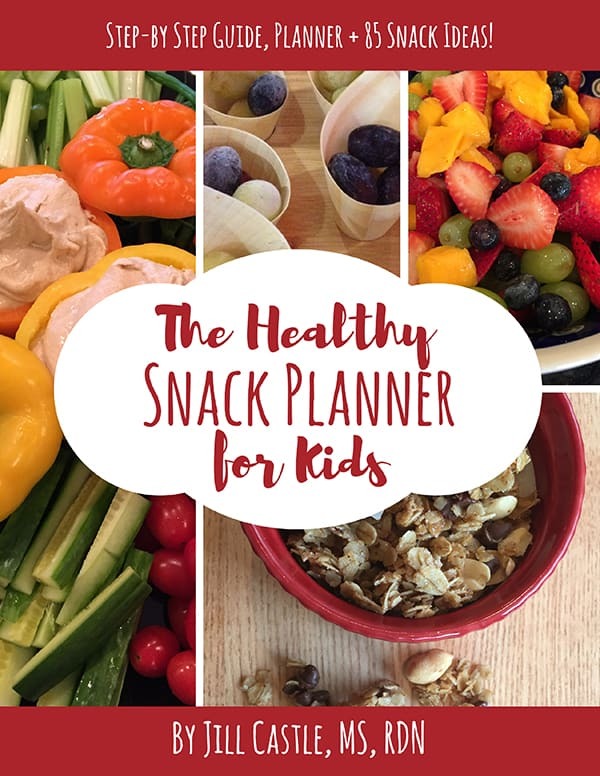 Check out my Healthy Snack Planner for Kids! Very Informative. A lot to adapt in our life. Age group of 5-15 children need proper nutritious food as the development of children at this age is at its peak. Having right food at right time is essential. But many can’t afford and still we are facing malnutrition in children in many countries. Though many charities taking the initiatives to provide food for hungry children through school lunch program, food for street children, malnutrition and hunger are still sin for society. Thanks Jill. Great topic, Kind of a sensitive one too: how to feed, but not force. How to offer food at predictable times so they feel secure, but also how to let them use their hunger/satiety cues. It is an act of balance. Many parents stress too much about their child eating too much or too little, when they sometimes should let go and let flow.